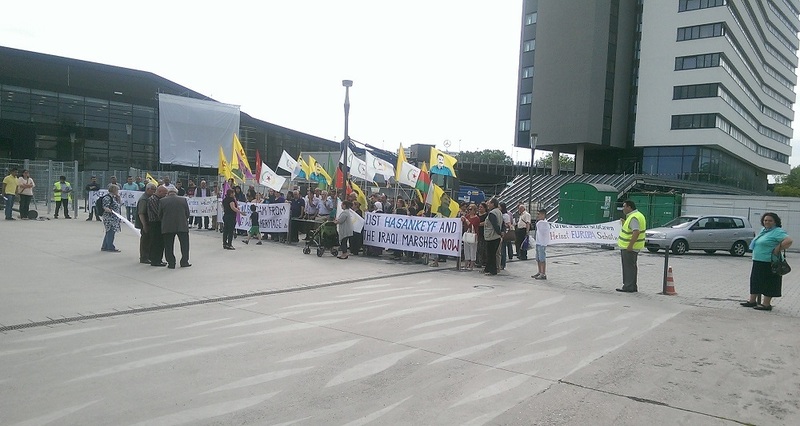 our campaign has brought together more than hundred people together with the active support of the Bonn group of the Tatort Kurdistan Campaign in the afternoon at the main entrance of the World Conference Center Bonn (WCCB) in Bonn where the opening ceremony has been organized. With banners, leaflets, brochures they draw the attention on the expected destruction of highest cultural and natural world heritage along the Tigris River in Upper and Lower Mesopotamia. This enourmus destruction would caused by the Ilisu Dam at the Tigris River which is under construction by the Turkish government.On the one hand the fate of the Marshlands of Southern Mesopotamia (Iraqi Marshes) is at stake. Large dams are a threat to the Marshes. The situation of the Marshes is deteriorating day by day, the area is already subject to severe droughts, water is scarce and native inhabitants are migrating from the Marshes due to lack of water. The Iraqi Government does not fulfills its duties to bring forward the application file process of the biggest wetland of Middle East and give a better protection for future generations.On the other hand the 12,000-year-old city of Hasankeyf on the banks of the Tigris River with its surrounding and traces of eastern and western twenty cultures in Turkish-Kurdistan, which according to an independent study fulfills 9 out of 10 World Heritage criteria, would be submerged. But the Turkish government refuses to save Hasankeyf and intends to flood although more than 90% of the society rejects the Ilisu Dam and wants Hasankeyf to be protected. Furthermore the WHC of UNESCO has been urged to start initiatives towards the Iraqi and Turkish governments which should rethink their approaches and protect the extreme outstanding universal values of Mesopotamia. For that the Ilisu Dam construction has to be suspended until comprehensive researches have been done.